Try as he might, Nintendo CEO Reggie Fils Aime just couldn’t get across the full effect of depth on the new Nintendo 3DS on video. 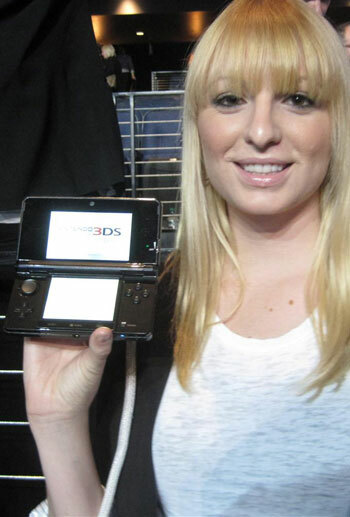 So he paraded out dozens of models with working 3DS demo units to show it off to the audience for real. First impressions: The home theater crowd is going to have a hard time hawking TVs with glasses next year. Despite its small 3.5-inch 3D panel, the Nintendo 3DS pulls off a convincing – and compelling – 3D effect in a form factor you can literally snap open on a train. Although early demos of autostereoscopic technology – 3D without the glasses – hinted at a technology in its infancy, the 3DS demonstrated none of the shimmering and strange effects we’ve seen in prior demos. Hold it a natural belly-level playing position, tilt the screen perpendicular to your vision, and characters and the environment literally leap out of the screen. The background also stretches deep back into it, the perceptual equivalent of an inch or two. 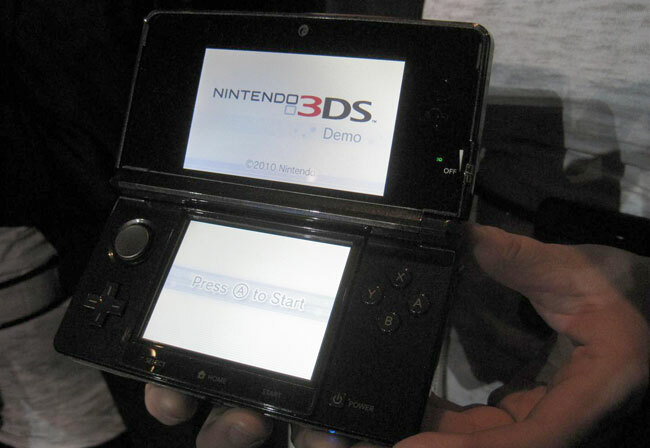 The 3D effect does start to splinter apart and eventually disappear when tilting the 3DS from side to side, but unless you plan on playing one handed, it’s almost impossible to hold it in the “wrong” position – an advantage we suspect will continue to allow handhelds to harness autostereoscopic 3D long before home theater catches up. The tilting of the screen also makes adjust the vertical viewing angle a cinch. The only downside, from the first impressions, would appear to be a relatively course and pixilated image – at least in comparison to many modern smartphone screens. It may be 3D, but it won’t set any benchmarks for 2D image quality in flat mode. With Nintendo announcing a slew of 3D games produced by third-party developers, including heavyweight franchises like Metal Gear and Resident Evil, plus a built-in 3D camera, the Nintendo 3DS actually looks like one of the most promising new platforms for both gamers and 3D aficionados alike. We might not even be surprised to see the game-averse Mom and Dad pick one up as a novel replacement for a $4,000 3D plasma in the living room, come fall.